Southern California anglers have had bluefin tuna to target in local offshore waters since late March. 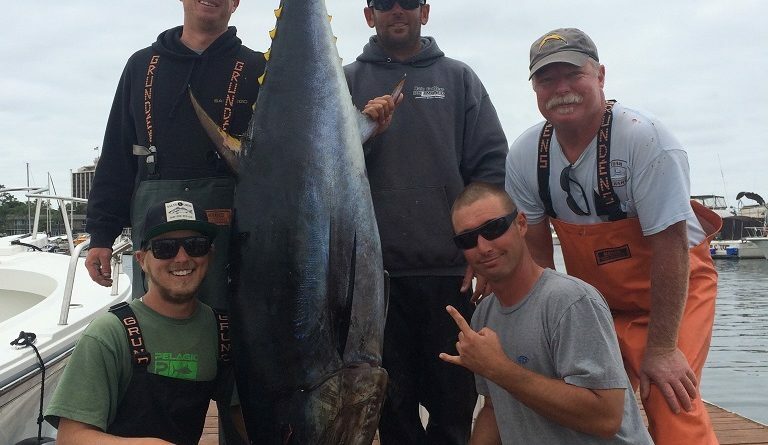 Southern California anglers have had bluefin tuna to target in local offshore waters since late March but the bite has been hit or miss and often scratchy. A big surge in the bluefin activity occurred in recent days and there are now a lot of bluefin tuna around with some jumbo-sized fish being seen in the mix. Most of the bluefin are within the 50- to 80-pound class but there are a lot of larger fish in the mix. Some bluefin have been estimated to be up around 250 pounds. The majority of catches were less than 100 pounds as the bluefin have often been spooky. The problem with landing the bigger bluefin when they are spooky: it is tough to get them to bite on a leader of heavy enough test to withstand the abrasion of the long battle it takes to get such a sizeable fish to the boat. The numbers of bluefin being caught are generally not high due to the size of the fish and because it has been hard to get them to bite. Every once in a while skippers find a spot producing a biting fish or two. The schools of breaking bluefin put on a great show. There is a lot of action involved with trying to get to the spots of breaking fish and get a bait, iron or popper to them before they sound. A lot of the excitement is in the chase and every once in a while the payoff is a hookup on a big bluefin tuna. The yellowfin have been nice sized fish with most in the 30- to 65-pound range. The yellowfin have usually been caught incidental to fishing for the bluefin, with an occasional blind trolling strike on yellowfin also being reported. Live mackerel that are drifted from kites have been effective for bluefin. Yummy Fliers trolled from a kite have seen occasional action. There is an occasional yellowfin tuna caught on trolled Rapalas. One of the best overall techniques has been to slow troll live mackerel around spots of breaking bluefin. There have also been occasions when bluefin will respond to chummed sardines. Most of the areas being fished for the bluefin and yellowfin are within 40 miles of Point Loma. Productive spots have been the 9 Mile Bank, the 224 Spot, the 182 Spot, the 43 Fathom Spot, the Corner, the 302 Spot, the 371 Bank, the 425 Bank and the Upper Hidden Bank. Of all those areas, the best fishing of the past few days has been for boats fishing the region of the 371 Bank and the 302 Spot. The surface fishing along the San Diego County coast has been producing a mix of sand bass, calico bass, rockfish and sculpin along with an occasional yellowtail or halibut. Red crabs have been thick in a lot of the kelp bed areas and with all that natural food around; the calico bass bite has slowed. Capt. Joe Cacciola of Sea Star with Sea Star Sportfishing reported fishing kelp bed areas at Carlsbad and finding good water conditions but slow calico bass fishing. He said the red crabs were thick at the kelp at Carlsbad and in a lot of kelp bed areas along the coast. He felt that the calicos were not hungry because they were stuffed full of red crabs. Private boater Robert Serdoz of Lucky Charm took his daughter out fishing for rockfish outside of La Jolla. He said they could not find any frozen squid to buy for bait and what he did instead was to scoop up a bunch of red crabs at the dock inside of Mission Bay. He took the red crabs out to the rockfish grounds outside of La Jolla and reported that they worked very well for bait. Serdoz and his daughter caught near limits of quality rockfish while fishing with the red crabs. The 2016 fishing season is improving each day as the summer months approach. 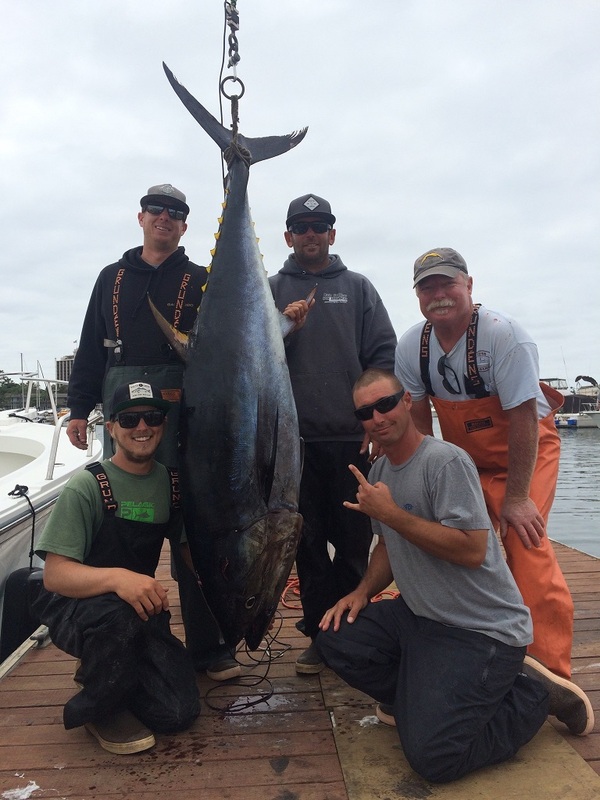 It is not often when we have 200+ pound bluefin tuna to target off the local coast. I hope you have a chance to get out there and experience the action and excitement involved with chasing and hopefully catching big bluefin tuna. Keep on fishing and I hope to see you out on the water!